nvolved in production support, maintenance and enhancement for PeopleSoft FSCM application primarily Inventory Management, Order Management, Item Management, Requisition and Purchasing. 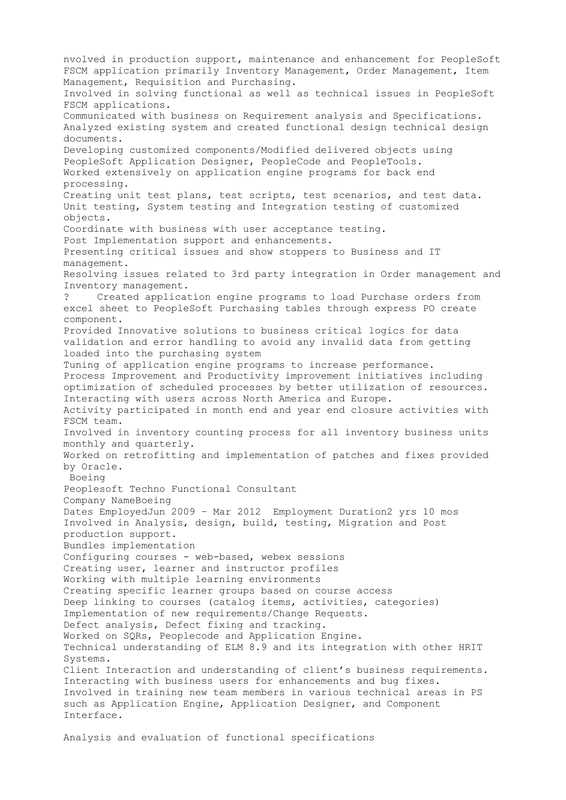 Involved in solving functional as well as technical issues in PeopleSoft FSCM applications. Communicated with business on Requirement analysis and Specifications. Analyzed existing system and created functional design technical design documents. Developing customized components/Modified delivered objects using PeopleSoft Application Designer, PeopleCode and PeopleTools. Worked extensively on application engine programs for back end processing. Creating unit test plans, test scripts, test scenarios, and test data. Unit testing, System testing and Integration testing of customized objects. Coordinate with business with user acceptance testing. Post Implementation support and enhancements. Presenting critical issues and show stoppers to Business and IT management. Resolving issues related to 3rd party integration in Order management and Inventory management. ?Created application engine programs to load Purchase orders from excel sheet to PeopleSoft Purchasing tables through express PO create component. Tuning of application engine programs to increase performance. Process Improvement and Productivity improvement initiatives including optimization of scheduled processes by better utilization of resources. Interacting with users across North America and Europe. Activity participated in month end and year end closure activities with FSCM team. Involved in inventory counting process for all inventory business units monthly and quarterly. Worked on retrofitting and implementation of patches and fixes provided by Oracle. Involved in Analysis, design, build, testing, Migration and Post production support. Implementation of new requirements/Change Requests. Defect analysis, Defect fixing and tracking. Worked on SQRs, Peoplecode and Application Engine. Technical understanding of ELM 8.9 and its integration with other HRIT Systems. Client Interaction and understanding of client’s business requirements. Interacting with business users for enhancements and bug fixes. Involved in training new team members in various technical areas in PS such as Application Engine, Application Designer, and Component Interface. •Designing functional and technical specifications. •Developed complex Inbound Interface to populate the tables in Procurement database from CSV files. •Development of Interface Developed an Outbound Interface to transfer data to ARIBA system. •Generate Reports by using SQR and PS query. •Developed SQR Interfaces (inbound & outbound) and Reports to load data from external systems into PeopleSoft GL. •Customized PO pages and Modified Purchase Order SQR as per requirements.